Completing the look with a pair of square-sunglasses, Ranveer pulled off the look handsomely like no other. Never the one to tone down his energies or quirky fashion styles, Gully Boy star Ranveer Singh looked every bit classy and royal as he dressed up to cheer his industry friends as they walked the ramp at the ongoing Lakme Fashion Week 2019. As showstopper Anil Kapoor walked the ramp for designer Raghavendra Rathore, with his niece, Janhvi Kapoor, who looked resplendent, Ranveer sat in the front row and looked nothing short of stunning. Sharing his look from the night on his Instagram handle, Ranveer posted a picture of his with the caption, “Turn down for whut” (sic). In the picture, Ranveer can be seen donning a red printed sherwani teamed with a pair of white coloured sneakers and brown pants. Completing the look with a pair of square-sunglasses, Ranveer pulled off the look handsomely like no other. Anil Kapoor walked down the ramp in a classy black-coloured bandhgala while Janhvi looked drop dead gorgeous in an enchanting black gown. After the show, which was an absolute treat, came to an end, a humble Ranveer not only posed with the stars but also with the fans who were bursting with excitement to get just one glimpse of their favourite actor. On the professional front, Ranveer is gearing up for his musical drama Gully Boy in which he will be starring opposite Alia Bhatt. The Zoya Akhtar directorial also includes Kalki Koechlin, Vijay Raaz, Siddhant Chaturvedi, Vijay Varma and Amruta Subhash in lead roles and is slated to release on February 14 this year. The movie is bankrolled by Farhan Akhtar and Ritesh Sidwani’s Excel Entertainment. 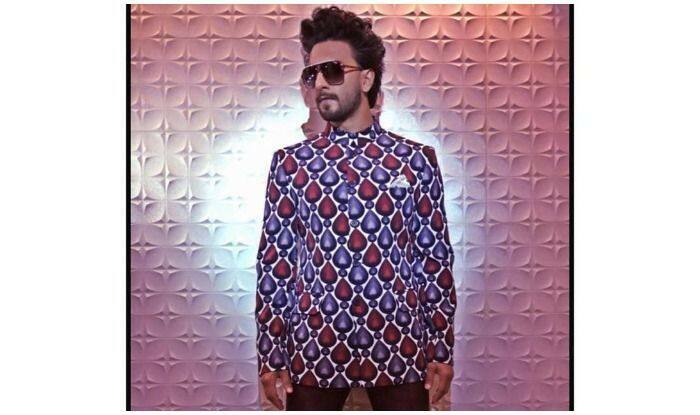 Ranveer will be seen playing the role of a rapper in the movie. On a related note, the actor has also started prepping for his next film ’83 in which he will be seen playing the role of Kapil Dev. Ranveer was last seen in Simmba with Sara Ali Khan. The movie collected over Rs 200 crore at the ticket window.